Very nice cover !! Looks good and fits well !! Really recommended !! Beautiful carpet with beautiful finishes! Fabrics of good quality with a very good cut !! I recommend for the price! Nice cover for a great price! I still buy one of these. Color is beautiful and the cover is so large that even the fur does not stand out. 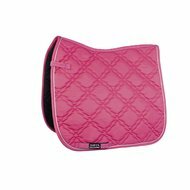 The cover is very nice and in line with my horse :) It is also nice and thin so my pony sweats less hard and the cover absorbs sweat well! It looks a bit lighter than in the photo. Question: What size can I compare the size of dressage with? Question: does the cover really look as bad as on the picture or is it because of the light? Answer: The cover gleams less than on the photo. The photographs of the other colors give a better picture of the gloss. Question: There is simply versatility but which size is that? 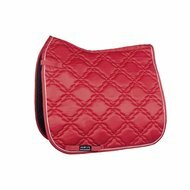 Answer: The size of this saddle cover is size full. Answer: A size Full would fit for a 17.5 inch saddle. 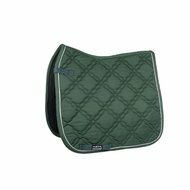 Question: I have a 17,5 inc saddle versatility fits dressage or do I have to take a pony dressage? 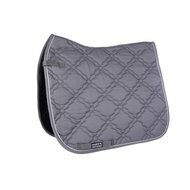 Answer: A full dressage cover also fits under a 17.5 inch versatility saddle. 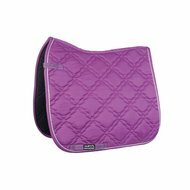 Question: What is size PD for saddle cover? Answer: PD stands for Pony Dressuur. Question: Hello I have a question about your size what is the difference between the versatile and the PD? Question: Hello, I had a question about the size of this cover. 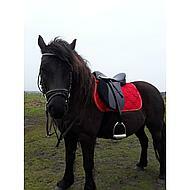 PD is pony dressage but does it also fit a D-pony / Cob? Thanks in advance! 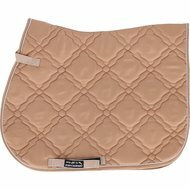 Answer: From saddle size 17 inches we recommend size no PD (pony dressage) but dressage (comparable to size full) to order. Question: Is this a set or can you order a matching ear net here? 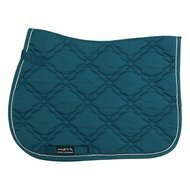 Question: are the girth and saddle loops with Velcro? Answer: Yes, these are with Velcro. Question: Is the cotton cover? Answer: This cover is made of 100% polyester. Question: Hello, I had a question about the size of this cover. It does not state whether it is Full or so so how do I know which size I should have? Thanks in advance. Lysa van der Jagt. Answer: You can choose from different sizes. 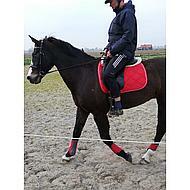 PD = pony dressage. PVZ = pony versatile. The others are in size Full. Answer: PD stands for Pony Dressuur. PVZ stands for pony Versatile. The choice 'dressage' or 'versatile' is for horses. Dressage is the right choice for this question.